Loyola Marymount University (LMU) started using recycled water for campus landscape irrigation in 1997. The water is supplied by LA Department of Water and Power (LADWP). It is secondary treated wastewater from the City’s Hyperion Treatment Plant which is pumped up to West Basin Municipal Water District’s Water Recycling Plant on Hughes Way and Sepulveda Blvd where it is given tertiary treatment and disinfection to comply with California Department of Public Health requirements. From there the water is pumped through a system of “purple pipes” to LMU and Playa Vista. The water which is treated and recycled would otherwise be “thrown away” into the ocean. In the early days of operation, LMU was about the only major user and there were some problems with odors due to the long residence time in the pipes. Remember, recycled water has nutrients in it which are actually beneficial to the landscaping. The “rotten egg” odor was objectionable to many of the students during the nighttime irrigation. LMU tried adding chlorine, but that left a residual in the water that impacted some of the sensitive plants on campus. So chlorination had to be discontinued. There were number of meetings between students and administration and LADWP. In November 2004, LMU went back to irrigating with potable water. 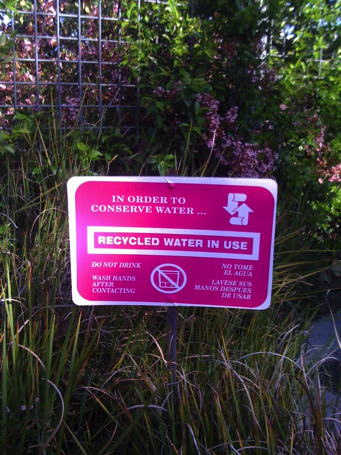 Several years later, LMU installed a hydrogen peroxide feed system for the recycled water. Hydrogen peroxide was added to the recycled water at the connection point with LADWP. This was done at the suggestion of Professor Reichenberger who had experience using hydrogen peroxide for control of rotten egg odors. Hydrogen peroxide leaves no residual and does not harm the plants. This system allowed LMU to switch back to recycled water again. LMU was first to use hydrogen peroxide for this purpose and received an award from the California Water Reuse Association. The system was so effective, that LADWP has installed a peroxide feed system on the main pipeline, so LMU does not need there system any longer. Using recycled water has other benefits. LMU’s recycled water contains about 220 lb of nitrogen and about 20 lb of phosphorus per million gallons. This saves LMU the cost of purchasing chemical fertilizers. One million gallons of LMU’s recycled water contains $90 worth of nitrogen and $45 worth of phosphorus. And the nitrogen and phosphorus are fed every time irrigation occurs – nice and slow so the plants can easily absorb them. Another good use of recycled water is for toilet flushing. Many commercial office buildings in Irvine in Orange County, CA use recycled water for toilet flushing. LMU’s new Life Science’s Building has been dual plumbed to convert the toilets to recycled water in the future. As more buildings are added to the campus, consideration will be given to using recycled water in the toilets. About the Author: Joe Reichenberger, P.E. BCEE is Professor Civil Engineering and Environmental Science at LMU and has over 50 years of hands on experience in the design and operation of water recycling facilities. Some projects that Professor Reichenberger has been involved in include Pepperdine University’s water treatment and recycling system, Palm Desert Water Reclamation Plant, Carmel-Pebble Beach Water Reclamation system and the Dublin-San Ramon Water Reclamation Plant. If you want to learn more about water recycling, Professor Reichenberger and his long-time colleague at Parsons, Dr. Madan Arora, have just written a book “Turning Sewage into Reusable Water – Written for the Layperson” available on Amazon and Barnes and Noble.